Stitches and staples are used to keep wounds together during healing. They need to be removed within 4-14 days. The specific removal date depends on the location of the stitches or staples. Removal should not be delayed. Reason: will leave skin marks. Sutures that come out early cause the most concern. Face Cuts. If a face wound has re-opened, call your doctor now. The cut may need to be re-glued or re-stitched. It does not matter how long it's been since sutures (or glue) were placed. Body Cuts and Less Than 48 Hours. If the wound is elsewhere on the body, call your doctor now. The cut may need restitched (or glued) if gaping open. This is sometimes done if suturing was less than 48 hours ago. Body Cuts and Over 48 Hours Ago. Call your doctor now for advice. After 48 hours, re-suturing is rarely done (except on the face). After 48 hours, the sutured wound can be reinforced with tape. Cut Is Closed, but suture has come out early. The wound should heal up fine without any further treatment. Check with your child's doctor within the next 24 hours. Keep sutured wounds completely dry for first 24 hours. (4 hours for Dermabond skin glue). If needed, use a sponge bath. After 24 hours, can take brief showers. Avoid swimming, baths or soaking the wound until sutures are removed. Avoid getting Dermabond skin glue wet until it has fallen off. Reason: Water in the wound can interfere with healing. Cleanse surface with warm water once daily or if becomes dirty. Change wound dressing when wet or dirty. 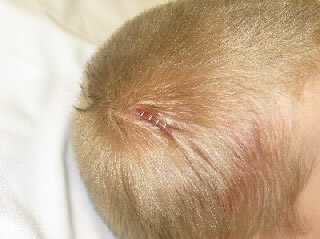 A dressing is no longer needed when edge of wound is closed. This takes about 48 hours. Exception: Dressing is needed to prevent sutures from catching on clothing. Don't miss your appointment for removing sutures. Leaving sutures in too long can leave skin marks. Sometimes, it can cause scarring. It also makes taking the sutures out harder. If the sutures come out early, close the wound with tape. You can also use a butterfly bandage (such as Band-Aid). Do this until the office visit. Protect the wound from injury during the month after. Avoid sports that could re-injure the wound. If a sport is essential, cover with tape before playing.